Australia's Best Value Golf Balls! Satisfied or money back - no questions asked! Callaway is one of golf's most famous brands and their products stand at the pinnacle of the game. Callaway golf balls are used extensively on every professional tour in the world and their balls have won every major numerous times. 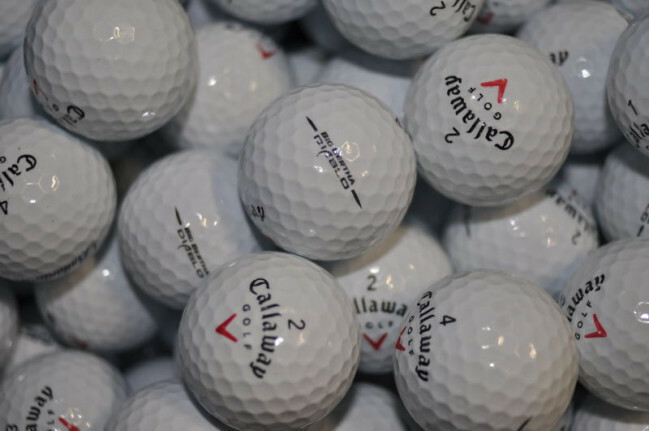 Callaway golf balls have long been recognised as at the forefront of technological advancement and they have pioneered many improves in ball technology. The hex dimple design is unique amongst all brands all cherished by golfers worldwide. These items are a random mix of all Callaway golf balls, including many of the new models like Callaway Super Soft, Warbird, X2 Hot, CXR, CXR+, Diablo and many more. These orders do not include tour balls such as Hex Black and the Tour i series. Each of these golf balls has been hand graded twice by one of the Lost Golf Balls team members and as such the quality is second to none. Really good value, got the product I ordered and promptly. Can’t ask for much more. All that was ordered was delivered as ordered and in very quick time. Perfect!! Quality product, excellent value...and great service. We will be Happy to Help You!!! Teams of professionally trained staff are always at your service to take care of all your queries. Please note: Do not use this form, if you have any questions in-relate to order you placed, product availability, product return and shipping policies. In such cases, call us direct on hotline number (1.111.111.1111) and talk to our customer care executive. Great Value In Callaway Golf Balls Callaway is one of golf's most famous brands and their products stand at the pinnacle of the game. Callaway golf balls are used extensively on every professional tour in the world and their balls have won every major numerous times. Callaway golf balls have long been recognised as at the forefront of technological advancement and they have pioneered many improves in ball technology. The hex dimple design is unique amongst all brands all cherished by golfers worldwide. These items are a random mix of all Callaway golf balls, including many of the new models like Callaway Super Soft, Warbird, X2 Hot, CXR, CXR+, Diablo and many more. These orders do not include tour balls such as Hex Black and the Tour i series. Each of these golf balls has been hand graded twice by one of the Lost Golf Balls team members and as such the quality is second to none. Lost Golf Balls supplies premium quality used golf balls at great price. All our golf balls are hand graded here in Australia. By purchasing from Lost Golf Balls you will save over 40% when compared to new ball prices. Each order comes packed with free tees as well - saving you even more money! © 2017 LostGolfBalls.com.au All Rights Reserved.